Interim Conservative Leader Rona Ambrose said it's "shameful" that Prime Minister Justin Trudeau is pulling back Canada's CF-18 fighter jets from the fight against ISIS, while the NDP sees the changes announced today as having the potential for mission creep. Interim Conservative Leader Rona Ambrose says it's "shameful" that Prime Minister Justin Trudeau is pulling back from the combat mission against ISIS in Iraq and Syria, even as the United States lauds the new Canadian contribution. The Alberta MP said Trudeau's plan to pull CF-18 fighter jets back from the region by Feb. 22 was tantamount to surrendering Canada's role in the fight against global Islamic terrorism. "Mr. Trudeau likes to say 'Canada is back,' when in fact we are stepping back," Ambrose told reporters in Moncton, N.B. "Every ally in the fight against ISIS has stepped up their military efforts in the bombing mission, and Canada is now, today, ending our combat role against what is the most heinous terrorist organization we've seen in my generation." The interim Conservative leader pointed to the extremist group's rampage through Iraq and Syria, its enslavement of women and children and its "barbaric" treatment of gay and lesbians as proof that ISIS is the "greatest threat to human rights in the world." "Mr. Trudeau doesn't think its our fight," Ambrose said. "If he doesn't think that we should use our military against this group, I don't know when he thinks we would ever use our military. It's shameful, it's absolutely shameful." The prime minister announced Monday that while Canada's role in the bombing campaign would end, that contribution would be supplanted by a much larger contingent of military trainers on the ground and an increase in the number of Canadian military personnel overall. Canada will also provide hundreds of millions of more dollars in humanitarian aid for the region to help Syrian refugees fleeing the horrors of the civil war that has beset their country. Steve Day, the former top commander of Canada's elite JT2 special operations force, was broadly supportive of Trudeau's move, saying the Liberals are on the "right track." "I think [the new mission] will make a significant difference because you are tripling the capacity of that training mission and, for the long-term win, you need to build that indigenous [Iraqi] capacity and capability. Tripling the training mission is a great call. Pulling the CF-18s fighters is a loss of capability for the coalition, Day conceded, but "if the calculation is less aircraft equals more trainers, then OK, I can understand that logic." Trudeau tried to preempt criticism of his plan Monday, saying his government would not resort to hyperbole in its fight against the terrorist group. "Call us old fashioned, but we think we ought to avoid doing what our enemies want us to do. They want us to elevate them, to give into fear, to indulge in hatred, to eye one another with suspicion and to take leave of our faculties. The lethal enemy of barbarism isn't hatred, it's reason," the prime minister said. Ambrose said those remarks are a display of Trudeau's naïveté. "I think it's dangerously naive. I don't know what else to call it. This is a group of people that enslave women and children, that throw gay people off of the top of rooftops to their death and that burn people alive in cages. "There's no reasoning with terrorists of this kind, that's why it's important to send a very clear signal that we are willing to do what it takes to fight a threat of this nature," Ambrose said in a later interview with Rosemary Barton on CBC News Network's Power & Politics. The New Democrats took a much different tack Monday, raising red flags about potential mission creep as the number of military trainers increases. "We are concerned that the Liberal government has chosen to place Canadian Forces personnel deeper into an open-ended combat military mission in Iraq," the NDP's foreign affairs critic, Hélène Laverdière, said in a press release Monday. "[The] Liberals promised to end the Conservative government's mission and said we need a clearer line between combat and non-combat. Today's announcement actually blurs these lines even more," Laverdière said. While the Conservatives slammed the move, the United States, which is leading the coalition against ISIS, said Monday it supported the Liberals' mission shift, calling it a model for other countries looking to take the fight to ISIS. "The Canadian announcement is the kind of response the secretary's been looking for from coalition members as the United States and our coalition partners push to accelerate the campaign against [ISIS]," Peter Cook, a Pentagon spokesperson, said on behalf of U.S. Defence Secretary Ash Carter. The U.S. official seemed to reject the assertion that air bombings alone are what is required to defeat ISIS in the region. "It is not all aircraft, there are a host things other countries could do that we think would further this effort and Canada is an example of a country that is adjusting its contributions in very specific ways that will certainly help the coalition moving forward," Cook said. 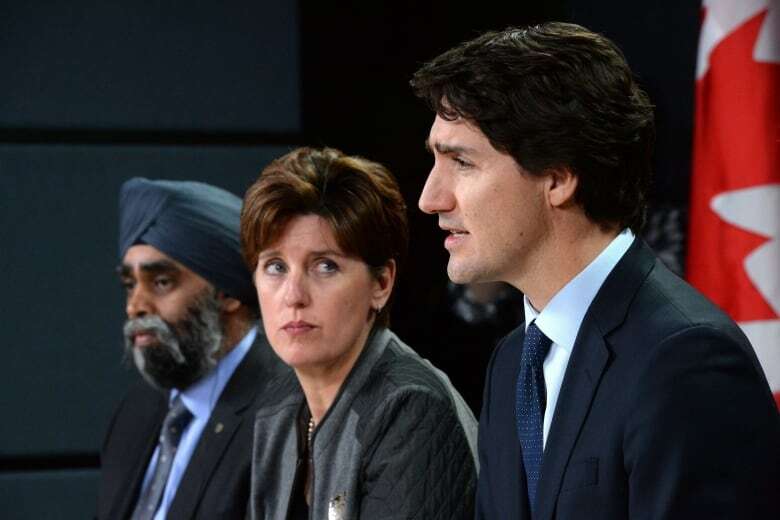 What do you think of the Liberals' anti-ISIS plan?